 Each year, ADAO dedicates April 1-7 to increasing awareness of asbestos and preventing exposure by bringing together experts and victims from around the world to share, learn, and take action. Global Asbestos Awareness Week (GAAW) is dedicated to educating people about both the risk of asbestos and how to manage it in order to prevent asbestos-caused diseases. While promising research continues, prevention remains the only cure. When it comes to asbestos and mesothelioma, knowledge truly is power. This week is about delivering that power: we seek to equip people with the tools they need to protect themselves while we work for preventative legislation and a cure. The week features daily educational resources from leading organizations, including guest blogs, videos, and asbestos victims’ stories. It will end on April 7 with an online candlelight vigil. We are excited to once again partner with artist and activist Firdaus Kharas to feature a different Public Service Announcement video each day, which will capture the tragic reality about deadly asbestos. These 30-second animated clips will be available in six languages. 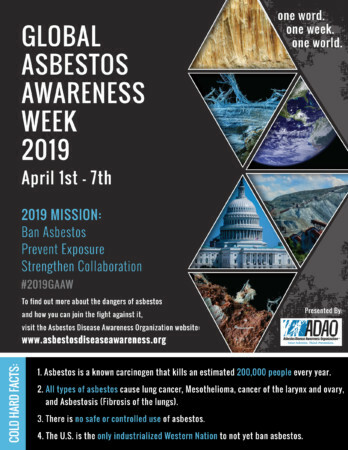 We are also thrilled this year to dedicate one day of GAAW 2019 to our newly introduced bill in the U.S. Congress, the Alan Reinstein Ban Asbestos Now Act of 2019, which would fully ban asbestos in the U.S. within 12 months. It is exciting to see the global community unite and collaborate for Global Asbestos Awareness Week. Thank you for joining us during this week of learning and community! Please follow the week via our website and through social media using #2019GAAW. You have proven that together we make change happen. Press Release (Spanish): La “Organización de Concientización Sobre la Enfermedad del Asbesto” (ADAO, por sus siglas en inglés) lanza su “Décimo Quinta (15ª) Semana Mundial de Concientización Sobre el Asbesto” del 1ro. al 7 de abril de 2019.